If your local business has an online presence, you need to keep up with local search marketing trends to make sure it stays at the top of search rankings. There are thousands of different local SEO trends for 2019, within this blog post I have condensed it down to 5 of the most exciting current SEO trends. Local SEO – Search Engine Optimisation – means using the tools and methods of search engines such as Google, Bing and Yahoo to improve your website’s visibility locally, which will ultimately lead to an increase in business when reaching the correct audience. By optimising your website to perform well in these search engines, you can ensure that your customers will find you when searching for a product or service you offer. But local SEO trends and local search trends are always changing, and in 2019 it’s more important than ever to keep on top of developments. To make the most out of your latest digital marketing efforts, you have to learn about the latest search trends. Here are some of the best local SEO trends for 2019. 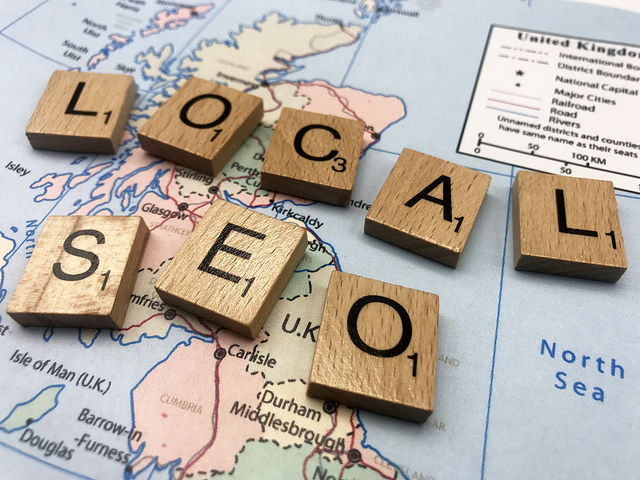 Local search marketing can be tricky and therefore it can be tempting to feel that your online campaign has to reach a world-wide audience, but does it really? Locally targeted SEO activities can offer a better return for your investment, and when budgets are tight, they can be the way to go. There are SEO techniques to make your business more visible even if it is in a very competitive industry. For instance, using common keywords such as ‘optician’ will not automatically bring your business to the top of search engines; but less competitive but highly relevant local terms such as your location will bring benefits. The key is to understand the terms your customers use in searches, and to select them for the local audience. Complimenting SEO with highly targeted local search marketing campaigns in Google Ads can deliver your message to prospective customers based on their geographical location and have loads of advantages. One is that you can create local-specific ad copy which will appeal directly to your local customers. Another is that this resonates with Google, and can improve the quality score of your ad by increasing your clickthrough rate, lowering your cost per click (CPC). Within local search trends Google Ads offers lots of geo-targeting options, such as location by country, state, city, or even postal codes. You can target a group of locations (up to 1,000 within one country), and select a distance radius around a specific location. The drop-down menu will show you the estimated number of signed-in users in the area. You can also exclude unwanted areas. If you own a bricks-and-mortar store which serves a local area or has a set delivery radius, this is an ideal way to make sure that your campaign is targeting the most valuable customers. Top Tip: Plan your strategies based on how people are searching for their business, by city, location name, street name or local landmark. Including location-specific terms in your ads along with your keywords helps you to remove unwanted traffic. Don’t forget to include local keywords; for instance ‘chippy’ for a chip-shop or ‘offie’ for an off-license. Keep an eye on Google Trends to identify new search-words. This technology can become useful within your local search marketing campaigns for your business. This is one of the best local search marketing skills which you need to consider within an SEO campaign. Doing this current SEO trend will ensure you are taking advantage of using your location within different keywords and will hopefully get you ranking higher on google. One of the most modern and current SEO trends is Smart speakers. Smart speakers such as Amazon Echo and Google Home are making it easier for consumers to interact with search engines, and voice assistants such as Google Duplex, which adds the ability to make calls using a human-sounding voice to Google Assistant, are increasingly popular. The great thing for business is that they’re built to improve your interaction with consumers. Say you want to book an appointment at a hairdresser. Google Duplex can place the phone call, have a conversation with the employee at the other end, and send a confirmation of the appointment. Try it for yourself to understand the mindset of the consumer – what do they want from voice search, and how do home assistants work for them? This technology may have a negative effect on traffic to local business’ websites, so how can you prepare for the proliferation of voice search and home assistants? Research suggests that 75 percent of smart speaker owners perform searches for local businesses on a weekly basis, showing how relevant this technology is to bricks-and-mortar businesses. But voice search can also be used to find information such as opening times on businesses the customer already know about. Because Google’s voice search assistants normally answer queries using information in the top ‘position zero’ ranking, it’s essential to research and discover the sort of questions users ask Google and create suitable website content for your local search marketing campaigns. Find the popular questions asked about your type of business using keyword research, then enter the queries into Google and note where there isn’t a satisfactory response. Here’s your chance to come up with suitable website content enabling you to grab Google’s ‘position zero’ in search responses. Voice searches are usually informational, covering location, relevance, and prominence. You can’t change your location butyou can boost your relevance by making sure the content on your website is relevant to search queries, and prominence by encouraging positive online reviews. Top Tip: Mentions on social media, listings in business directories, and mentions in local papers will boost your reputation and make it easier for voice search to find your business. Current SEO trends change each month or even week, however this local search trend isn’t that new at all, but it is vital in any Local SEO campaign. Generating reviews of your business is essential to improve your ranking in Google local searches, so how can you build reviews and keep them up to date? Surveys suggest that over 86 percent of consumers use reviews to evaluate local businesses, and 91 percent of 18-34 year olds trust reviews as much as a personal recommendation, so it’s no surprise that Google’s ranking algorithm values them highly – it’s a ‘virtuous cycle’ in which more reviews lead to better visibility, which leads to more customers, which result in more (and hopefully better) reviews. So where should you focus your efforts to encourage reviews? The answer is, on the sites where Google expects popular businesses to have reviews. Whether that’s the industry giants Yelp and Facebook, or industry-specific and local review sites like TripAdvisor, TrustPilot and Feefo, look at the sites that show up in Google’s Knowledge Panels for your competitors, and look for other high-ranking businesses similar to yours in other geographic markets. Once you know where you need to see your reviews, tools such as Trustpilot can be used to automate your review collection with customisable invitations and reminders that are sent to your customers after every purchase. You can improve your customer experience by identifying review trends, tracking your review response rates, source, and ratings change using Trustpilot’s analytics tool, and quickly and easily integrate your reviews across social channels, your website, email marketing campaigns, display ads, and even video advertising. TOP TIP: Sites listed in the ‘Reviews from the web’ sections of Google’s Knowledge Panels have direct relationships with Google to feed them reviews. This current local SEO trend is vital for any business. Current SEO trends such as this should be incorporated within any SEO campaign. One of the most current SEO trends is proximity marketing. This technology is one of the most hyped local SEO trends for 2019.. Proximity marketing, which targets passing customers with advertising messages, was supposed to be the Next Big Thing – if you’ve seen the 2002 movie Minority Report you’ll remember the scene in which the hero walks through a mall and is exposed to advertising using his name and preferences. Until recently, though, the technology hasn’t lived up to the hype. With Google Beacon, though, the time for proximity marketing may have come. The beacon devices send out signals over a range of a few metres, and are picked up by compatible iOS, Android and other devices. Possible applications include notifying tourists about landmarks as they approach them, displaying a shop’s current offers, or indeed personalising ads. Because the data flow is two-way, there are many potential applications for the technology; mapping consumer movements around a store, measuring how often people visit the same locations, recording how long they spend there and how these relate to sales, guiding them and cross-selling with related products, for instance. But the potential doesn’t stop there; customers could be sent special offers, loyalty rewards, recalls and other promotional messages. The latest beacon technology, Google’s Eddystone, is 100 percent open-source, and transmits multiple types of signal simultaneously. It makes software development and hardware implementation much easier, and means they can be registered and programmed through the Google Cloud platform. Cities including Amsterdam are beginning to implement Google Beacons as part of a ‘smart city’ project, so it looks as if the Minority Report predictions for the year 2054 are going to be with us a lot earlier – at least in terms of proximity advertising. The Google Beacon local SEO trend might not be for you. However, it’s defiantly something to be aware of going into the new year. Who knows? A Google beacon could be vital for your business in 2020? Lastly, one of the most fascinating and incredibly useful current SEO trends is local inventory. This could be one of most anticipated local SEO trends of 2019. With the limited stock of bricks-and-mortar businesses being challenged by the in-depth stockholding of online, it’s a challenge to drive footfall. But Google Local Inventory ads could be the solution. According to Google, nearly a third of all searches are related to location, and this is the chance for bricks-and-mortar businesses to snare a potential customer. When a user makes a product search on Google and the product is in stock at a nearby location, they can be served a Local Inventory Ad with an attractive “in store” label. A click brings them to the Local Storefront page, featuring the product that was searched for as well as information about the physical store. This local search trend can be a very important tool for your business. Google Local Inventory ads are currently supported in Australia, Brazil, Canada, France, Germany, Japan, UK, and the US, and as well as commonly required product data, you will also require a full Local Product feed and Local Product Inventory feed (with details like store code, item ID, quantity, and price). Adjust for traffic hours. Keep ads active at all times, but focus on opening times and peak business hours. Allow for conditions. Cater for real world patterns – you won’t sell much ice-cream in the winter or outdoor activities when it’s raining. Analyse store visits. Google’s Store Visit reports can help you to record when your strategy is paying off. Though LIAs are ideal for promoting campaigns such as Black Friday, it’s important to keep them running every day as part of your overall ad strategy. To avoid cannibalizing clicks from your Google Shopping ads, don’t create completely new campaigns or accounts just for local ads right away. Needless to say, the essential element of LIAs is to keep them up to date. The product inventory must be refreshed every day, and the Local Products feed once a week. It’s a challenge, but manageable using automated feed management tools. Doing SEO by yourself can be very time consuming – it takes a lot of time, work and analysis to keep a website as optimised as possible. That’s where TRON Media can help. TRON Media has a highly qualified team of trained SEO specialists, ready to tackle the optimisation of any website. TRON Media is a leading Digital Marketing Agency located in Brighton, offering the easiest and most cost-effective way to help you find your audience. Get in touch today to find out about our latest SEO services. Contact us using our Contact Form, call Lasharie in London on: 020 7870 9041 or Simon on: 020 3006 6889 or by emailing us at: [email protected].